Rose of Tralee Maria Walsh made a dramatic entry to this year's festival - falling from the sky with a rose clenched in her hand. The planned tandem parachute jump had been called off earlier in the day due to bad weather. As soon as the skies cleared, however, it was back on - with the reigning Rose anxious to stay true to her word and complete the feat. 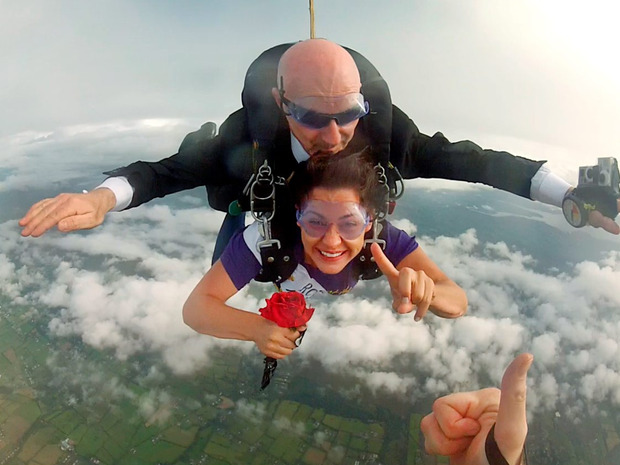 She made the jump with Carl Carey, as Damian Cahill presented her with a rose in mid-flight. "I got a rose in freefall!" she said afterwards. "And I tell you what, Tralee looked pretty sweet." The plunge from the skies followed a 220km run and cycle from her home in Shrule, Co Mayo, to Tralee, the first time a Rose has ever done this. "It was me that was pushing for this to happen," Maria said. The inspiration for the skydive came following a visit Down Under earlier this year. "Myself and my mother jumped 15,000 feet in Perth - as you do," she said. "My sister lives there and she had done it, so we said if she could do it, we could do it. "But it's grand because it's tandem, so you're stuck with someone. So the worst thing is you have to stick your legs out and then they push you." According to the bookies the Rose of Tralee favourites are New York Rose Sophie Colgan and Meath Rose Elysha Brennan, a medical student in Dublin.